VuePointe, the all-new, gated neighborhood now selling in the San Gabriel Valley, invites you to start flexing your visionary muscles; to start thinking creatively about space; and to have an entirely different, ahem, point of view about home. It’s a modern, exciting change for El Monte. And we’re thrilled to share it with you. So here it is. 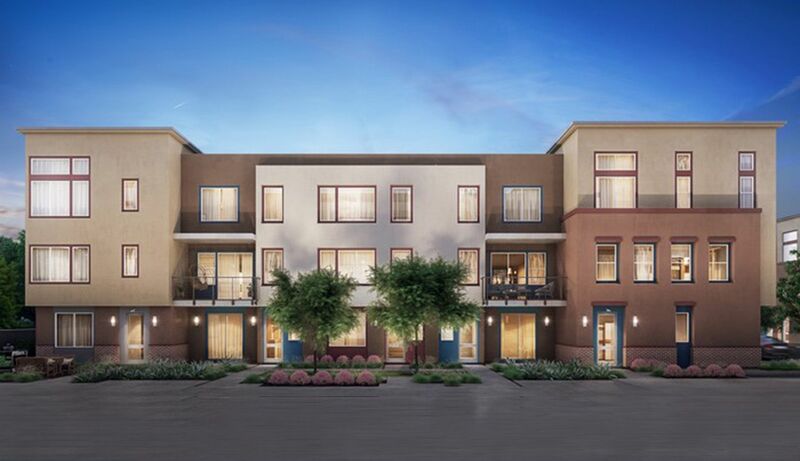 VuePointe is where you’ll find three-story townhomes designed to take urban living in an enticing, engaging direction. Accessible to L.A.’s major transit corridors, VuePointe beckons with its park-like Center Green, a place for families and neighbors to gather for BBQs, playdates and celebrations. Well-designed 2- to 4-bedroom, 2.5- to 3.5-bath homes maximize their footprint so you can maximize your freedom—to host weekend guests in a downstairs suite; sip coffee from your deck; create your perfect work environment from your home office. Even fill up that master bedroom walk-in closet with your shopping splurges. Kitchens at VuePointe boast modern style and—better yet—thoughtful features like work islands and pantries. And great rooms can flex to be a homework zone one minute, and the site for a grown-up soiree the next. High on the cool factor, low on maintenance—that’s the promise of VuePointe. Starting from the mid $500s mid $600s, models from the mid $600s.